I have always been a vegetable lover. As a child I would eat seconds of my veggies and loved broccoli and spinach. One vegetable that we never had was Brussel Sprouts so I always assumed they were gross little green balls. As an adult I never really had any desire to buy them but one day while grocery shopping my daughter asked me to buy a bag in the frozen food section. So I did. I made them and no one would touch them. They were soggy little things, overcooked by the steam bag.I knew there had to be a better way to make brussel sprouts and my daughter still wanted her brussel sprouts. I came up with this recipe accidentally and it has become a fast family favorite since. It is quick and easy and doesn’t disappoint. 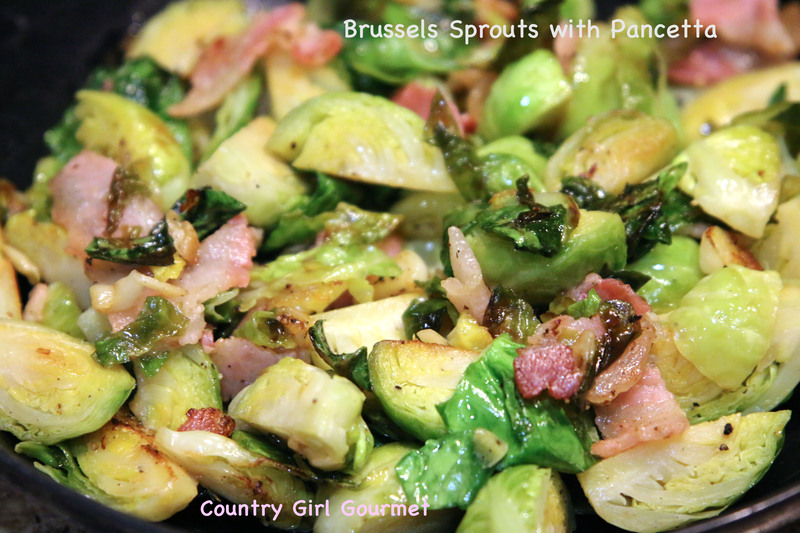 I highly suggest trying these Brussel Sprouts with Pancetta and giving these wonderful sprouts another try! 1. Wash and cut Brussel Sprouts into quarters. 2. In a large skillet using medium heat melt butter and then add Pancetta and sauté until it begins to crisp. 3. Add Brussel Sprouts and garlic and sauté until brussel sprouts start to brown and are cooked thoroughly. This should take less than 10 minutes.